Volkswagen has announced that it will display the Golf GTE Sport, a 400PS plug-in hybrid with a carbon fibre body, at the Worthersee GTI festival. Worthersee is an annual celebration of all things Volkswagen Group, and despite being a largely fan-based event, it has become a showground for official manufacturer debuts of the more extreme kind. This year’s event coincides with the 40th anniversary of the Golf GTI, so the Golf GTE Sport is one of two GTI-themed show debuts, the other being the Golf GTI Clubsport. That car – which Volkswagen has not released an official picture of – will get 265PS with a short-term overboost function for an additional ten per cent power, a distinguishing body kit, and bucket racing seats as standard. Back to the GTE Sport, it’s still a concept but could form the basis of a super hybrid within the next couple of years. Its plug-in petrol-electric hybrid drivetrain propels it to 62mph in 4.3 seconds and on to 174mph, by combining a 299PS 1.6-litre turbo engine with twin 115PS electric motors, for a total 400PS output and four-wheel drive. 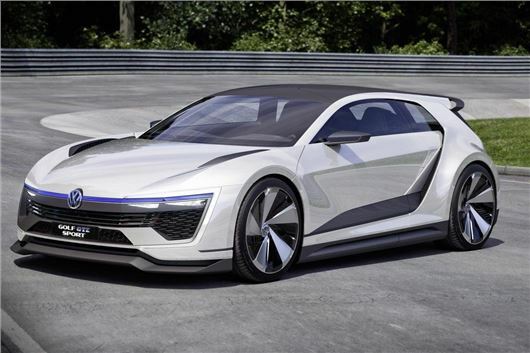 Despite that it returns 117.6mpg on average, says Volkswagen, and it can drive around 30 miles on battery power alone. Its carbon fibre construction makes it much lighter than the average plug-in hybrid, although if it ever does make production that will be scaled back – as will its unusual interior, which only seats two, each in their own monocoque-style area.